ADATA last week introduced its third SSD featuring 3D NAND memory. The new SD700 is a dust, water and shockproof drive that has up to 1 TB of capacity as well as a weight of only 100 grams. The SSD uses the USB 3.0 interface and is compatible with the majority of modern PCs. The ADATA SD700 comes in a metal enclosure with rubber inlays/pads to ensure hermetic sealing and shock resistance. The company plans to offer three configurations of the drive with 256 GB, 512 GB and 1 TB capacities, all featuring up to 440 MB/s read speed (as conditioned by the maximum real-world transfer rate of USB 3.0 interface due to overhead incurred by 8b/10b encoding). The claimed transfer rates of the SD700 are the same as those of the Samsung Portable SSD T3 (which also used 3D NAND), but the real-world performance of the novelty is yet to be discovered. From a compatibility point of view, the external drives are also similar: they can work with Microsoft Windows, Google Android and Apple macOS. The SD700 from ADATA is based on 384 Gb 3D TLC NAND flash chips made by IMFT and while the SSD maker does not reveal specifics, it is highly likely that the drive uses Silicon Motion’s SM2258 controller (just like other 3D NAND-powered products by ADATA) accompanied by a USB-to-SATA bridge. ADATA designed and tested its SD700 drive to IEC IP68 standard to ensure that it dust-tight and can operate for 60 minutes while submerged in 1.5 meters of water. In addition, the maker also tested its new external SSD to the U.S. Army MIL-STD-810G516.6 shock and drop resistance standard. The SD700 will join ADATA’s family of external SSDs and will be among the first 3D NAND-based external drives that meet the IP68 and the MIL-STD-810G516.6 requirements. The endurance of 3D NAND, as well as the rugged design, will make the ADATA SD700 a good choice for users that who transfer large amounts of data often and would like to ensure that their information will not be corrupted either as a result of degradation of non-volatile memory or because of a physical damage. For additional piece of mind, ADATA offers a three-year limited warranty with its SD700 drives. 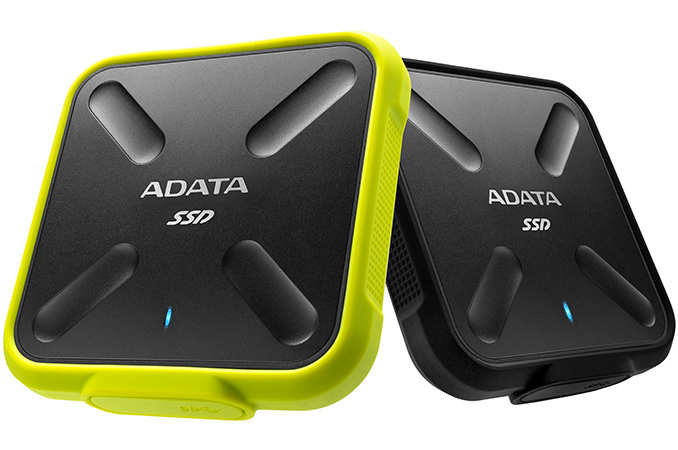 The ADATA SD700 external SSDs will be available in all-black as well as black and yellow color schemes shortly at Amazon and Newegg. The 256 GB version will cost $109.99, whereas the 512 GB version will be priced at $189.99. At least from a pricing standpoint, the new SSDs from ADATA look very competitive because they are roughly two times cheaper than LaCie’s Rugged Thunderbolt + USB 3.0 SSDs of the same capacity. I think he was being funny. And frankly I would "of" found it quite amusing, except his phonenitc substitution for 've was so distracting it wasn't much fun by the time I realized what he was saying.